Last weekend we played a little tournament run by our esteemed Sir Wayne Turner (title pending). To give you a bit of background, Wayne had just finished putting the last little bits into the upcoming Barbarossa book, when he he mentioned that he'd like to play more Early War games. Several of us in the studio agreed, so Wayne set a date for a staff 1500-point tournament and then we got on with the important task of writing lists. As with all such events, my mind races with list possibilities. The first port-of-call is my trusty Panhard AMD-35 company, but I had some other lingering thoughts. I had just bought and assembled a pile of Matilda I and II tanks, so I thought that might be a fun list to play with a lot of those wonderfully awkward Matilda Is, what with Very Slow and all! I also considered finishing up my Light Panzer Company, but I needed to do up a platoon of motorized infantry--a task I wasn't prepared to do. I even considered Italians, as my Carri company is painted in green-grey for Greece, but I couldn't make up the 1500 points with what I had painted. In the end I had a sudden desire to play my medium panzer company. I used it against Steve MacLauchlan earlier this year and I really liked the way the Panzer IVs worked with the Panzer IIIs. So I took that list and modified it slightly (perhaps for the worse, in retrospect). My force was rated Confident Veteran. I had worries about having three platoons, but I decided to play my games aggressive but safe. Besides, I've not used my EW Stuka yet and I figured that it would yield better results than a dug-in pioneer platoon lingering in the back would. All arguments aside I finally went for the Stukas because 'why the hell not' seemed pretty convincing. Wayne organised the event for one game on Friday after work, and three games on Saturday. This worked well in my opinion because I reckon a 4-game tournament gives better results than a 3-game one. Plus it gave me a night to sleep on the problem of defeating Andrew's Finnish infantry with my eight tanks... but I get ahead of myself a bit! I forgot to grab my camera for Friday's game, so I apologize for my bad phone photos! Chris had his french infantry, backed by countless anti-tank guns, some Somua S-35 tanks, as well as light and heavy artillery batteries. ...Nine platoons in total and he was dug-in. With his troops deployed, I lined up a major assault against his right flank, or as I liked to call it, the flank without any field guns. Chris retained a platoon of 47mm anti-tank guns in ambush, so I knew I'd have to deal with them, but at least I could do so without harassing fire from 75mm field guns. Everything went into the flank, and thankfully Chris' ambush only bailed out a few Panzer IIIs. After concentrating fire on the guns and then the infantry, I blew open a gap to the objective and rushed forward. Chris kept the objective hot for several turns and the fight was tough. However, as the French number dwindled, I was able to push him back and secure the objective without any platoon losses. A 6-1 for the panzers. After the first game we broke for the night, but not before setting up the draw for the next morning. I drew Andrew was instantly fearful of his Fearless Veteran Finnish infantry with lots of close-defense teams! Luckily I had a night to sleep on it, but I arrived the next day with no new answers or ideas. It would be a tough fight! The mission was announced as Counterattack and I saw my first ray of hope. Andrew's list, while hard as nails, was mostly static (well as static as a Finnish infantry company can be!). With a pair of T-28s as his tank element, I knew I'd have to deal with them first, followed by his 76mm artillery platoon. While that gun battle raged on, my reconnaissance achieved the outlying objective and prepared to receive Andrew's infantry task force dispatched to capture it. My Stuka helped by pinning down Andrew's infantry and guns, preventing them from assisting. The Panzers knocked out the T-28s though a lot of hits, one kill, multiple bails, and a failed morale check that took Andrew's CiC along with it. The Finnish tanks dealt with, I slid my panzers to the left towards the objective and engaged the Finnish guns with the Panzer IVs and intercepted Andrew's infantry with the Panzer IIIs and the armored cars. The only way I stopped the Finnish was to destroy each and every team through firepower as morale was not to fail Andrew! His taskforce destroyed, and the objective held by my armored cars, the game ended in another 6-1 victory for my Panzers. Coming off of 12 VP, I ran straight into Phil's Armoured Regiment. Outnumbered nearly 3:1 in tanks, I pulled the job to defend against an opponent that could out deploy and concentrate firepower where I couldn't. I deployed my armored cars on my left flank holding two objectives. The Panzer IVs and my CiC Panzer IV held the center village. My 2iC Panzer IV held the far right flank on his own. The Panzer IIIs, held in ambush, responded to Phil's push on my right. The game that followed was intense with many burning tanks. The 2iC, unluckily, went down to a volley from 15mm gunfire. Another Panzer IV was lost to 15mm fire in the center, but my return fire removed a platoon of Cruiser tanks, and the Stuka bailed out the command team of another Cruiser platoon, halting that platoon's advance on my right for a turn. The battle degenerated quickly into a whirling firefight. The Panzer IIIs dealt death blows to another Cruiser platoon and managed knock out some marauding Mark VIs. My Panzer IVs worked on the Cruiser platoon in the village with the surprisingly effective 2cm guns of the 222s. The battle climaxed with the loss my armored cars after taking a lot of incoming fire. The CiC attached to prevent their loss to morale as their 2cm guns and presence were vital for holding the far left objective, but they both failed and I lost a significant amount of firepower in an instant. In my turn, I knocked out Phil's CiC cruiser. The last surviving Panzer IV rushed to contest. The Panzer IIIs failed to destroy Phil's last Mark VI platoon on my left flank, despite it's 12 shots at Trained targets-in the open... Still they were all Bailed Out. In Phil's turn, my last Panzer IV was bailed out, literally with Phil's last shooting die, and failed it's platoon morale check, which instantly lost me the game. Had that Panzer IV survived, I would have destroyed that Mark VI platoon with my Panzer IIIs as it was all bailed out and surely Lady Luck would be kinder the second attempt? Without a CiC or 2iC, Phil's severely depleted force would have been destroyed in his next turn. What could have been a 5-2 Victory sadly became a 3-4 Loss! The final game of the weekend was a Free-for-All against Aaron's panzers. We loaded up our tanks with paint-ball ammunition and hit the training grounds in a free-for-all battle. Aaron's force was built around Panzer IIs and IIIs with some recon and a pair of BunkerFlaKs, which worried my panzers greatly! I weighted my left flank where there was more cover and played an agressive game, as did Aaron. Our reconnaissance mixed it up in a rather epic fight as the Panzer IIIs and IVs battled each other nearby. My Panzer IIIs played a game of cat and mouse with the Bunkerflaks, eventually knocking them out with the help of the Stukas. With that threat finally lifted off my shoulders, my Panzers pressed forward and toward my left. Aaron poured the pressure on my left flank, with Panzer IIs arriving in force to tip the balance of power. Out numbered, my Panzer IVs and armored cars fought to buy time for the Panzer IIIs to arrive or capture the objective. However, Aaron's gunnery was spot on and knocked out most of the armored cars and one Panzer IV. The surviving Panzer IV, the 2iC and CiC lent their fire to the situation and managed to knock out the Panzer II platoon, barely. 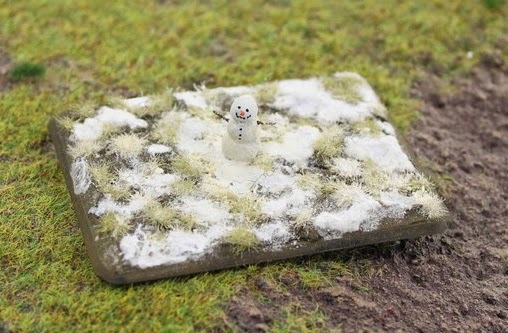 This caused a company morale check in Aaron's army and they quit the field, earning my panzers their third 6-1 victory. This score betrays just how close this game really was. We played one more turn to see what Aaron's Panzer IIIs would have accomplished had he passed the morale check. They ended up destroying the last Panzer IV platoon, the armored cars and my 2iC, putting me on a company check, which I failed! It was a very tough fight! I did not expect my panzers to do so well. I thought the three-platoon nature of the force would get me into trouble, but in the end I was able to manage that problem. The biggest problem I faced was not the small platoon count, but poor firepower rolls. I'm considering changing my list to all Panzer IVs in the future. With smoke everywhere and problems on the battlefield that need attending to, your tanks are on the move so you're better off with 3+ FP than the higher ROF offered by Panzer IIIs. The jury is still out on the Stukas. They were helpful in some missions, and managed to knock out things that would otherwise have required me to commit panzers to deal with. This worked out well. I'd probably investigate the option to take the spearpoint upgrade for them as I seemed to roll in an awful lot of single plane sorties! Anyway, I had a great time with the guys and it was fun to play some Early War. I've already been considering modifications to this list for FlamesCon, should I play in the EW tournament there. Thanks to Wayne for setting up the tournament, and to Chris, Andrew, Phil, and Aaron for being great opponents! Great report, and outstanding results with such a small force! Great reporting and a very ballsy list you took! Congrats for the win. Two panzer lists just like the ones played in Early War. Cool. They suit my style of play. Well done you on such a good result with them. Mike, out of interest...how do you treat/play the rocky type hills in your third game?